New York Public Library better ramp up security: a gum chewing six-year-old holy terror is about to take up permanent residence in their archive. Yes, Eloise is prepped and ready to write on the walls and skate down the halls, thanks to the only man who'll ever own up to being her father, illustrator Hilary Knight. On November 3, 2009, Knight donated his personal papers, including sketches for over 60 books, theatrical posters, contracts, and publicity materials to the Library. 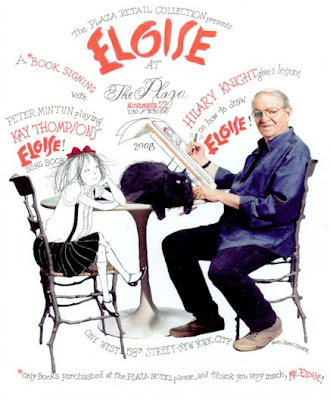 Knight is the co-creator of Eloise, along with author Kay Thompson. Thompson has long held the spotlight as Eloise's literary mother, but no less a luminary than Maurice Sendak, author/illustrator of Where The Wild Things Are, credited Knight with making her famous: "My first happy response to Eloise was entirely due to the brilliant, iconic images. That brazen, loose-limbed, delicious little girl monster is Hilary Knight at his best." Eloise was born in 1955, but she is forever six years old. She lives in the penthouse of the Plaza with her nameless nanny, her pug dog Weenie, and her turtle, Skipperdee. Eloise's father is never seen or spoken of in any of the five books in which she appears. Her mother is perpetually absent. She never goes to school. (She does have a "boring boring boring" tutor who she listens to, but "not very often.") All of her meals are charged to Room Service. (A typical order is: "Planked Medallion of Beef Tenderloin with Fresh Vegetable Maison, two raisins, one strawberry and one clams in season.") 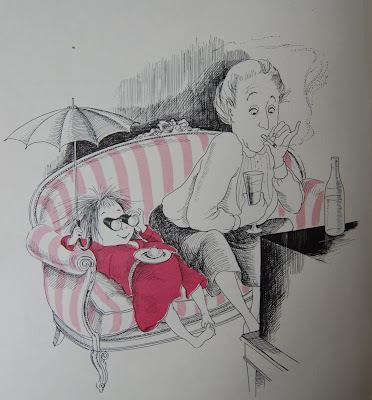 She would be the original anti-heroine of children's literature, except that author Thompson insisted that the Eloise stories were: "Books for precocious grown-ups." And nobody with a brain challenged Kay Thompson. Including Hilary Knight. According to Marie Brenner of Vanity Fair, Knight and Thompson were introduced by a mutual friend in 1954. 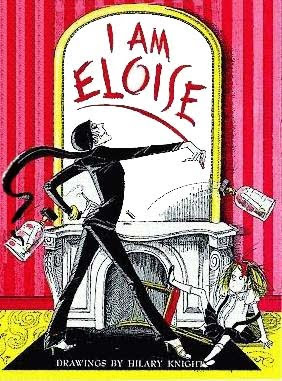 Thompson had already created the character of Eloise, which was based more than a little on the author herself. At first the relationship between author and illustrator was a pleasant one, according to Thompson: "Hilary and I had immediate understanding.... We wrote, edited, laughed, outlined, cut, pasted, laughed again, read out loud, laughed and suddenly we had a book." Shortly before the publication of Kay Thompson's Eloise (make a note of the exact title--it's important), Knight caught his first glimpse of the less than friendly side of his collaborator. At a meeting with their publisher, Knight was given a one-page contract. He recalls: "I totally trusted her. I signed it without really looking at it. I totally signed my rights away." 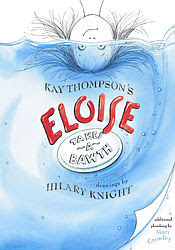 The contract gave Thompson the copyright to Knight's drawings, and 70 percent of the royalties not just on Kay Thompson's Eloise but on any future books that featured the Eloise character. Knight and Thompson went on to collaborate on three more Eloise books, but their relationship grew increasingly strained. In 1966 Knight arrived in Rome to work with Thompson on fifth Eloise story. Knight had drawn hundreds of sketches of Eloise in an overflowing bathtub, creating a flood which engulfed everyone from visiting movie stars to the Plaza's manager. Thompson hung his drawings haphazardly snarled:"Think of this as a movie." She would compliment Knight's work at night, but the next morning, he recalled: "That drawing that was so glorious would have a big clot of rubber cement on it, and there would be a piece of paper over the drawing." At Thompson's request the book was yanked just before publication. It remained unpublished until after the author's death in 1998, when her estate released it as Kay Thompson's Eloise Takes A Bawth. Knight wasn't the only one to feel the wrath of Thompson. A few years before Thompson took up permanent residence in the heavenly version of the Plaza, the New York City's Books Of Wonder featured a window display celebrating Eloise's 40th anniversary. An employee working late one night received a phone call from Thompson inquiring: "What is the title of the book in the window?" "Well, it's Eloise," replied the hapless clerk. Thompson shouted: "That is incorrect! The title of the book is Kay Thompson's Eloise!!" Thompson's obituary in The New York Times put her age at "between 92 and 95." 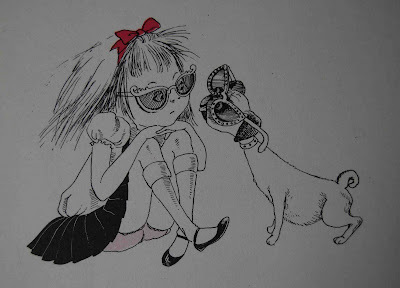 But like Eloise, it appears she was in many ways perpetually six years old. Who was left the royalties to the fabulous Eloise books?